Every election sees lots of politically conscious people hitting the pavement to campaign for their candidates. Voter registration drives, leafleting and yard sign distribution have become the order of the day for many activists. We in Socialist Action certainly commend people who take politics seriously and who are committed to fighting for what they believe in. And we believe that elections can a play a positive, albeit limited, role in the struggle for change. However, when asked who we will be supporting in the upcoming elections, our answer often surprises many. As a matter of principle we never support candidates of the main capitalist parties - the Democrats and Republicans. We also decline to support the candidates of the various liberal 3rd parties, like the Greens or the Justice Party. Instead we support what is called working class political independence. This holds that working people should only support Socialist or Labor parties and candidates. And when there isn't a Socialist or Labor candidate on the ballot, we either abstain from voting or spoil our ballot. Most progressives in the U.S. have resigned themselves to either working in the capitalist Democratic Party, or in one the liberal 3rd parties. Since there isn't yet a Labor Party in this country, and the Socialist movement is too small to put up more than a handful of candidates, they argue that our refusal to support Democrats or liberal 3rd parties is impractical and even dangerous. But we see things very differently. We believe that the electoral system has been set up and rigged by the powers that be to limit the issues and candidates presented to voters to those that don’t fundamentally challenge the status quo. Restrictions on who can get on the ballot, the denial of press coverage for third party candidates and the need for outrageous amounts of money to run a competitive campaign add up to make it all but impossible for alternative ideas and candidates to get a fair hearing. The U.S. electoral system is designed to prevent real change from happening. But luckily for us, elections aren't where real change happens anyway! Social change comes through mass action – people taking to the streets, going on strike and building social movements. Liberal politicians like to take credit for the gains of the past. But every piece of progressive legislation was fought for and won by social movements in the street. Only after the battle was defacto won were these gains codified into law by politicians who had to be dragged kicking and screaming. Elections can serve a positive role, but it's a limited one. When we run candidates we do it as an educational campaign. Our candidates use their campaign, and their office if they win the election, as a platform from which to reach and mobilize people into the streets, and to get them thinking about alternative, revolutionary ideas. In other words we use elections to build social movements, the exact opposite of what the Democratic Party does (which has earned the well deserved nickname of "graveyard of social movements"). And most importantly, we use elections to raise the idea that we need to stop supporting the parties of the 1% who are responsible for the injustices of the world, and instead build a truly working class party. We live in a world divided by class. The interests of big business is diametrically opposed to that of working people. None of the major parties (and few of the 3rd parties either!) admit this. Groups like the Democratic Party may seek to woo workers, students and minorities, but don’t forget that they accept millions of dollars from the same corporations as the Republicans – and nobody gives anybody millions of dollars unless they get something in return! That’s why when push comes to shove, on all the major issues, both major parties trip over themselves to support the policies that benefit the rich and hurt workers. Just look at what they’ve done to welfare and other social programs, not to mention their willingness to send us off to war for the sake of oil! The idea of working class political independence is that we need to build a working class party that will run working class candidates. We can't and are not ever going to be represented by millionaires and self-described liberal saviors. That may mean that for now we don't always have someone to vote for. So be it. Lets put more energy into social movements and into building a working class party that someday will be able to run candidates in every election. It can be done! 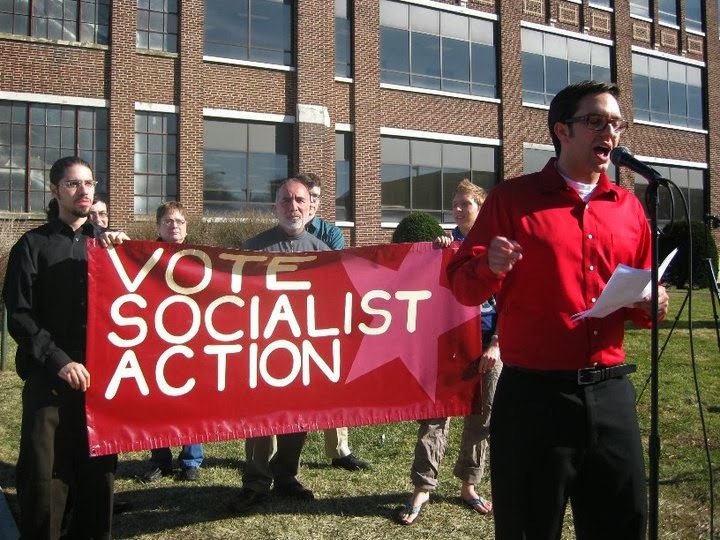 Locally, Socialist Action has from time to time put up candidates using the philosophy of working class political independence. In 2006 we successfully ran Adam Ritscher for the Douglas County Board of Supervisors. We've also run candidates in student and union elections. In all of these elections though we ran to popularize socialist ideas. We have used each of these campaigns as a soapbox for the social movements we're involved in, and to try and educate the public about the need for class independence. We have a long ways to go to build a viable workers' party in this country. But if we keep at it, avoid compromising shortcuts, and remember to keep the role of elections in perspective, we believe it can be done!